The garden at Saint-Antoine. The compelling view from our fourth-floor window. I use the word “compelling” not as a less conventional alternative to “pretty”, but literally. 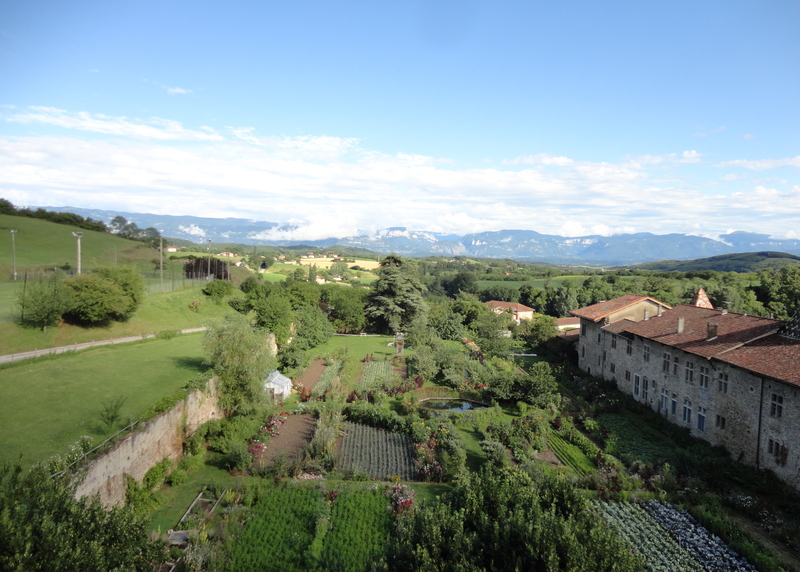 The view of the garden with the Vercors beyond it seems to pull the eye towards it and hold its attention with small, subtle, slow changes: Dominique or Doro moving among the vegetable rows, harvesting lunch; a veil of mist forming above the Isère flowing unseen in its valley; sun and shadows shifting as the planet turns. Deuxième Niveau at work and play. Six days working on non-Trajan Roman letters on textiles with brushes with Keith, and two days embossing on paper with Benoît Furet – such hard work requires frequent escapes to the Centre of the Universe (so designated by the Daughters): The Chapeau Rouge, for coffee or sometimes beer. In class… I include my watercolour sketch/postcard only because it shows my tiny attempt to follow Benoît’s embossing/gaufrage session. Everyone did very complex projects – look at Blandine’s fabulous tablier! – but I was preparing for the next week’s course. And there they all are (at right) attentively following Ben’s lucid presentation. He claims to have “learnt” embossing from Keith a decade or so ago; but he has taken it so far beyond the instruction he received then that we were mute before him. He works with very simple basic tools and produces wildly complex, and complex-looking results. But his presentation for us beginners was very clear. Everyone went embossing-mad. I am only sorry I am such a slacker at photographing end-of-course exhibitions. I back away because so many of the participants are photographing every piece at different exposures, &c. Then my usual practice is just to wait for them to send or post their photos. Mesdames et messieurs, vos photos? My present camera has an almost-totally-useless “panorama” feature, and a very irritating wide-angle lens: the Salle Blanche is not curved. Nonetheless, I like this photo of the end-of-course show because Doro is walking through it. Wonderful! Thank-you, Doro! And it gives some vague idea of the variety of the work produced. Benoît, as usual (and despite devoting two days to official teaching) produced an amazing range of beautiful work, but (also as usual) in the form of many small, complex, detailed pieces with long texts. They don’t occupy much wall (or photo) space. Go and look at his web gallery and see them there! Neither have I any photos of this course’s celebratory supper. Have you? You will have already seen Benoït’s excellent photos of many of your projects here. This entry was posted in letterish, uncategorized and tagged Amanda Adams, Annick Bethuin, Benoît Furet, Blandine Arnaud, Cal·ligrafia, Caligrafía, Calligraphie, Calligraphy, Carol Van Waart, Cathy Riva, Dominique Augier, Francine Freulon, Gérard Gosme, Keith Adams, Majuscules Romains, Marie-Do Lafond, Marie-Dominique Lafond, Non-Trajan, Roman Caps, Salva Donalbain, Salvador Muñoz, Xavi Vaqué i Sans. Bookmark the permalink. Merci Amanda pour cette initiative. Les photos sont sympa mais j’ai un peu de mal pour le texte…. Nous avons reçu ton album d’images de lettres romaines – Keith t’a remercié, non? Et le “J” était magnifique. Si il y avait un autre album, je ne l’ai pas vue.